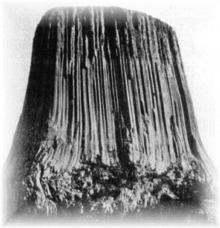 When I started doing my research into Devil’s Tower (DT) and the Durrance route I found that good information was particularly hard to find. I went to my local bookstore and bought the Flacon guide to climbing Devil’s Tower and the Needles, being the only guide available. Big mistake, the book is worthless and adds no info except for hazy black and white pictures. I was unable to secure a decent guidebook until I actually got to the tower and bought Devil’s Tower National Monument Climbing Handbook at the ranger station. You can order the book at P.O. box 37, Devil’s Tower WY, 82714. I hope this TR helps you plan in case your are planning on doing the Durrance route. We contacted Frank Sanders who runs a B&B literally next to the Tower. Frank, who is not only a great host, but is also a guide with many a first ascents in DT and offwidth lover extraordinaire, set us up with a cabin in a local ranch 6 miles from the park and with a view of the tower that is hard to beat. Deb, arrived Friday night, and after a quick dinner we turned in for the night. We were up at 4 AM. After a high carbo breakfast we left the house at 4:28 AM, two minutes earlier than planned as pointed out by Deb. When we got to the parking lot, (15-20 minutes later) there was another party racking up. As I signed us in, I met the leader of that party, Larry leading a group of teachers from Minnesota, 8 of them in total, 4 of them new climbers… We politely exchanged some verbal niceties and then rushed back to our cars and on to the approach trail, the race was on… We could hear them 30 yards behind us, the clanking of too many hexes being their give away. The approach begins heading right on the paved trail (tower trail) which loops around the tower. After about 20-30 yards, when the trail reaches the trees, your will see a faint trail leading left (towards the tower) and through a boulder field. As you look up you will see the tower shoulder (bench) and dead ahead you will see a ramp formed by two or three bent columns reaching into the boulder field the approach aims left of those ramps. In the twilight of dawn and the rush to beat our mid-western friends, I missed the easy ramp and we wound up doing the exposed ramp. The ramp went at about 5.2 with grassy footholds in most of the available cracks. While on the ramp, I could hear a party of two already on the route. We beat the party of 8 by less than half a minute (they dropped one of their 6 ropes and had to retrace their steps losing vital seconds). As it turns out, being 2 minutes early in the morning made the difference between starting the climb at 6 AM and starting it at 11 AM (time in which the last of the 8 was blasting off the first belay). In no time, there were 12 people besides us at the foot of the climb. In addition to the Minnesotans we had a group from Iowa University that was planning to cycle something like 20 folks through the Durrance on that day. Unlike us, the Iowans had decided to climb the last rappel pitch (5.5 130 ft) up to the base of Durrance. This proved to be a slower method…It was 5:35 AM the approach had take about 25 minutes. After waiting for about 20 minutes Deb started up the Leaning Column pitch. This pitch is 72 feet and rated at 5.7 in the guide book mentioned above. The best description I have heard regarding the rating of this pitch is: “ it is rated 5.6 (+), it’s really a 5.7 and it feels like a 5.8”. Couldn’t agree more. Some parties choose to link pitch one and two (leaning column and Durrance crack) which would make good logistical sense and a stiff “first lead of the day” (save your large pro for the Durrance Crack if you do this). Due to traffic reasons this was not possible for us to even consider. The route goes up two parallel cracks that widen and separate at the top until you have to commit to the right crack (right side in) which by then has turned into a large offwidth. The left crack starts at fingers and goes to fist and offwidth, the right crack starts at off width and stays there, waiting for you… There is plenty of pro on the left crack and there are a couple of pins that secure some of the scary moments on the pitch. The stylin’ way to climb this, is to jam the left crack and stem the lip of the right crack. But that right crack beckoned at me, and I spend a lot of my lead jamming left and right. The crux comes 15 feet from the top, after one last good foothold on the left and placing my number 4 camalot in the left crack, I moved right into the offwidth and tried to remember how to squirm up these things… After some toe/heel moves and much groveling I pulled over a bulge and onto a nice ledge. Deb followed up the second pitch with less huffing and puffing since she was able to stay out of the offwidth until the end, ahhh the prerogatives of having a rope in front of you…But her turn in the grinder was next. As I belayed Deb up pitch 3 and 4, I could hear teacher Larry huffing and puffing up the Durrance Crack. The sound came to a crescendo and then disappeared only to start again 10 minutes later. Once he reached the belay, he told me he had placed his # 4 camalot somewhere in the middle of the pitch only to realize he had reached the crux with 15 feet to his last pro and that the # 4 was the only piece that could protect it…so, he down-climbed to get the #4 and walked it all the way back up. Took him about 10 minutes to regain his composure when he finally topped out. At 40 ft and 5.5 one of the most pleasant and aesthetic pitches. Nice jamming up a crack/flake dihedral with plenty of pro, footholds and yes, no offwidths. As mentioned, Deb dispatched this one too, this is another 5.4 chimney with pro at the chockstones and lots of footholds. To exit the chimney, you have to clear an overhang or bulge. The exit grabbed my attention. The original route downclimbs right after the chockstone pitch and “jumps” to the meadows where you then proceed to scramble some 150 feet of exposed 3rd class dirt, grass and rock to the top. Having not had our fill with chimneys and offwidths, I proceeded to lead the Bailey direct. This is a 5.6 150 ft pitch described in the book as “moderate fifth class climbing”. It is the crack (chimney) furthest left when you are standing on top of the 5th pitch. Supposedly there is another crack even further left that is nicer and merges with the original Bailey half way up. Didn’t see it. The pitch is steep and goes from chimney to offwidth and back a couple of times. Protection is good and you will even find a pin on the first crux (40 feet into the pitch). The final crux comes at the end of the pitch where for the last 20 ft you can follow an offwidth (left side in) or move onto the face of the column where at 5.6, the holds are abundant but rounded and the pro is nil, as an added bonus, at this point in the climb, due to the steepness and length you are dragging two 165 ft ropes with the corresponding friction. I wandered up the face and eventually worked my way back to the crack on the left to place my number 4 camalot yet again, for a last piece before the exit. We used the meadows rappel. It is located left of the Baley pitch if you are looking from the summit. Marked by cairns it took some looking to find the bolts and some exposed but easy scrambling some 10 feet down and right (again looking from the summit). The second rappel was even harder to find. It is tucked around a rock under the Jump pitch. On the other side of the Durrance route. Lucky for us Larry was reaching the top of Pitch 5 and was able to point out the bolts for us. We were standing on top and couldn’t figure out how to get to them. Standing on the “landing side” of the Jump scramble down and left from the rock you are standing and then right and around that same rock. This brings you to a small ledge. Proceed left and around on the ledge to the bolts. Rappels 3 and 4 were straight forward. The last one putting you at the base of the bowling alley and 50 yards from the tourist trail.